I recently took a trip to the beautiful island of St. Thomas for a conference. In preparing for the journey, I decided I didn’t want to check my luggage and that presented all sorts of challenges. There’s the thoughts of what to wear when complicated temperature difference. And then there’s the cosmetic issue. For some guys, that’s the least of their problems. But when you like to smell good, you appreciate companies that can accommodate the TSA’s travel restrictions. On this particular trip, I took with me Atelier Cologne’s Bois Blonds and Aroma M’s Geisha Green. Both served me well. They have lasting power, and are quite versatile. Above the Purell Hand Sanitizer, which is a must when traveling, are sample jars I collected before my trip. I advocate sampling fragrances before making the plunge and the same goes for grooming products. The good thing about the jars is that they can be washed out and used on the next trip. Not much needs to be said about the Trident but since meals on planes are part of the revenue-generating model these days and passengers are opting to pass on paying for them, foul breath is running rampant. My choice was gum this time but a curiously strong mint would work well. Last but certainly not least is one of my favorite carry all the time items, L’Occitanne’s Shea Butter Hand Cream. $10 for class A looking hands seems reasonable to me and it doesn’t leave your hands feeling greasy. Anyhow, We’re packing lighter and lighter these days and the items we take better be all purpose. These are my essentials. This entry was posted in Uncategorized and tagged Aroma M, Atelier Colgone, Hand Sanitizer, How to pack light, L'Occitane, Purell, Travel Essentials, Trident. Bookmark the permalink. haha…great minds think alike! 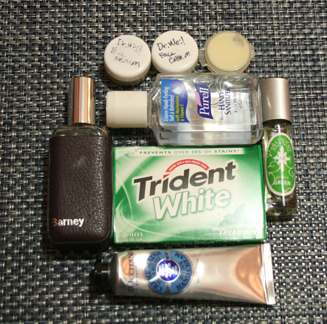 travel musts…switch out cologne for perfume. I love the monogrammed leather case for the Atelier Cologne bottle! Very nice. When I travel I always end up going out to Muji to get another travel atomizer (http://www.muji.us/store/health-and-beauty/containers/aluminum-atomizer-4-8ml.html) to put my latest favorite scent in. Which these days may be Eau d’Italie’s Bois d’Ombrie, a fragrance I’m returning to after not feeling it for a while. I’ll have to try out my sample of Atelier’s Bois Blonds again.